Louis Renault, founder of the Renault automotive company, has a life story which is both confusing and contested, though his contribution to automotive engineering and the French economy during the first and second World Wars is undeniable. 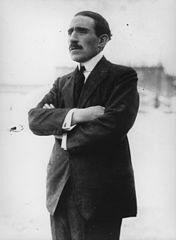 The fourth of six children, Louis Renault was born on February 12, 1877 in Paris. At the prestigious school, the Lycée Condorcet, he developed a fascination for engineering and mechanics. This led him to spend many hours of his free time in a steam car workshop, tinkering with engines. In 1898, Renault built his first working car, the Voiturette, by repurposing a motorised bicycle. He won a bet with friends that his Voiturette – equipped with an innovative crankshaft – would beat a car with a bicycle-like chain drive in a race up the Rue Lepic in Montmarte. In addition to winning the race and the bet, Renault won the attention of early automobile buyers, who put in 13 orders for the Voiturette. Realising the commercial potential of manufacturing automobiles, Louis Renault partnered with his two older brothers, Marcel and Fernand, to create a business. His brothers handled business administration while Louis oversaw the design and engineering aspects. In 1908, Marcel was killed in a motor race between Paris and Madrid, and Louis took over the business in full. Many of the Renault parts that he designed and patented are still in use today – most notably his brake drum and hydraulic shock absorbers. With the onset of World War I in August 1914, France had a dire need for artillery ammunition. Renault suggested that car factories could be repurposed to produce 75 millimetre shells using a hydraulic press, rather than the traditional lathe method, which took longer and was far more costly. In addition, Renault’s company mass produced the Renault FT-17 tank. For his service, he was awarded the Grand Cross of the Légion d’honneur after the war. In 1940, Hitler’s Wehrmacht invaded France and Renault handed control of his company to Vichy France, which led to him being accused of collaborating with the Nazis, though this was not the case. During World War II, Renault produced 34,232 vehicles for the Germans but Renault argued that in doing so, he kept thousands of his workers under his wing and safe from being transported to Germany. Renault’s factories in Ile Seguin and Billancourt became top priorities for British bombers, and they were ultimately destroyed in March 1942. Near this time, Renault’s health also began to suffer. After France was liberated in 1944, Renault was arrested on charges of industrial collaboration with Nazi Germany. He denied the charges but was imprisoned. In prison, his health deteriorated and he was moved to a private nursing home in Paris at the request of his family. He died on October 24, 1944, four weeks after his incarceration and still awaiting trial.